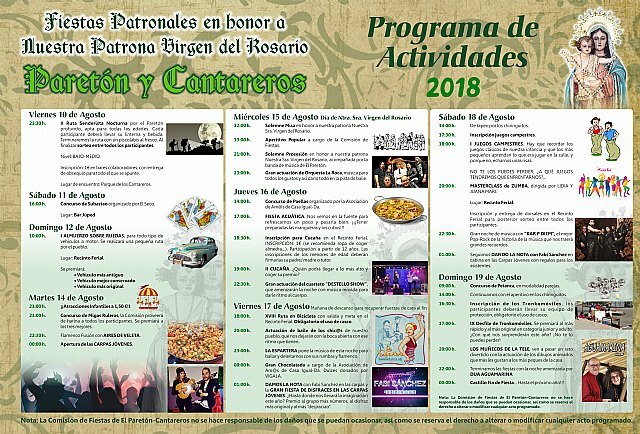 More than thirty activities make up the program of patronal festivities of El Paretón-Cantareros, in honor of the Virgen del Rosario, which are held from August 14 to 19 with an ambitious and numerous list of events, organized by the Festival Committee of this district. Although the program of activities begins on Friday August 10, the bulk of these is concentrated during the aforementioned days coinciding with the dates before and after August 15, day of Our Lady of the Virgen del Rosario, patron of this council. that start on August 10 with the 2nd Night Hiking Route for the district, low-medium level, whose registration is one euro and the meeting place is the Parque de los Cantareros (21:30 hours). 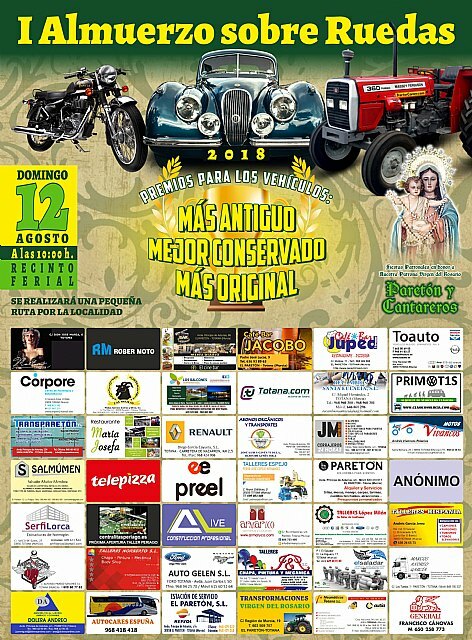 The weekend prior to the patron saint festival is already held: on Saturday the 11th the Auction Contest, organized by El Seco, at the Júped bar (4pm), and on Sunday the 12th the 1st Lunch on Wheels, in the fairgrounds, in which the oldest, best preserved and most original vehicles will be rewarded. 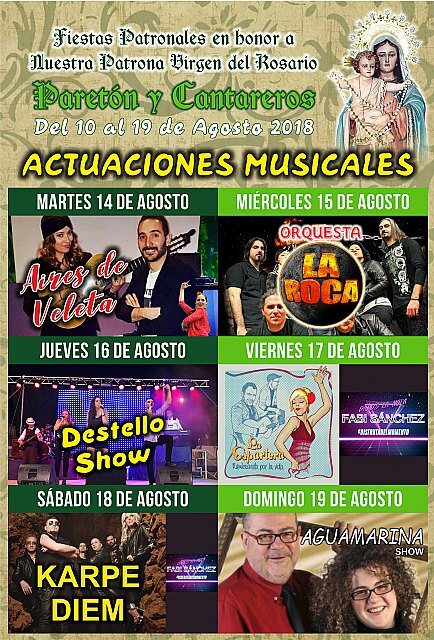 On Tuesday, August 14 begins the wide range of activities that will last for the next six days, with attractions for children (1.50 euros) and the Concurso de Migas Ruleras (21:00 hours) and the musical performance of the flamenco fusion group "Aires de Veleta". At midnight the Youth Tents will be opened. and at 9:00 p.m., the solemn procession with his image, accompanied by the music band El Paretón. and at 23:00, the great performance of the orchestra "La Roca". and in the afternoon the Aquatic Party (5:00 pm) and II Cucaña in the fairground (7:00 pm). At night, from 10:30 pm, the performance of the quartet "Flash Show" will take place. The program faces the weekend on Friday, August 17 in the afternoon, with the XVIII Bicycle Route (6:00 pm) and the dance performance of the children of the district (8:00 pm). and at midnight, the Gran Chocolatada by the Association of Am @ s of Casa Igual-Dá. Already from 1:00 hours, it will be the big Costume Party in the Youth Tents, with several prizes, and DJ Fabi Sánchez. On Saturday, August 18, from 2:00 p.m., the beach bars of the enclosure for tapas will be open. In the afternoon, it will be the I Games Campestres (18:00 hours) and the Masterclass of Zumba (20:00 hours), also in the fairgrounds. At night, the pop-rock concert of "Kar P Diem" will take place at 10:30 p.m.
and from 1:00, DJ Fabi Sánchez in the Youth Tents, with gifts for the attendees. and the IX Parade of Tronkomóviles (5:00 pm). Later, at 8:00 pm, it will be the performance of the "Dolls of the Tele", with the protagonists of cartoon friends of the boys and girls. 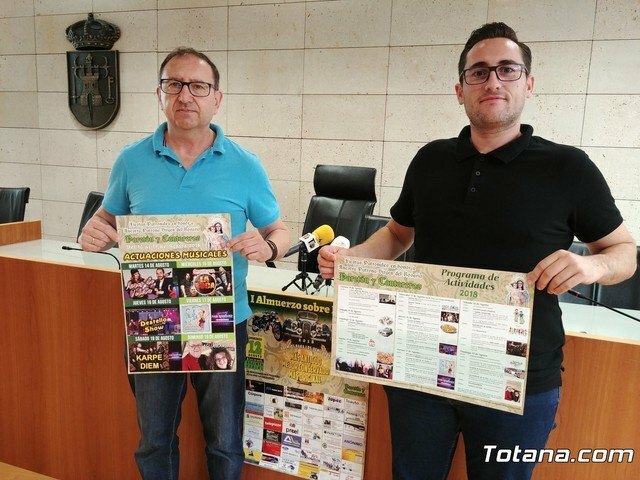 The party will end enlivened by the group "Dúa Aguamarina" (22:00 hours) and the fireworks castle at the end of the festival, which will put an end to this extensive and extensive program of festive activities.